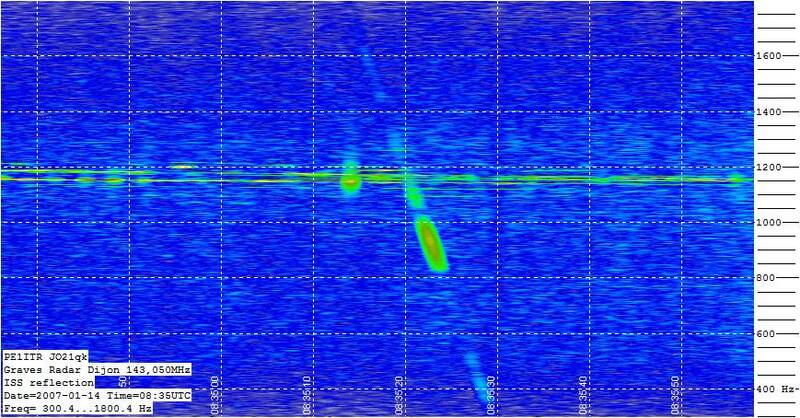 Moonecho's from de radar are easy to detect. Tune a SSB receiver to 143.050MHz and turn your yagi toward the moon. An audio signal can be heard after 2,5 seconds when de Radar Beam (red spots in animated picture below) is pointing to the moon (blue spot). Sometimes the radar beam is time shifted a few steps by the command station. This is not showed in the animation. 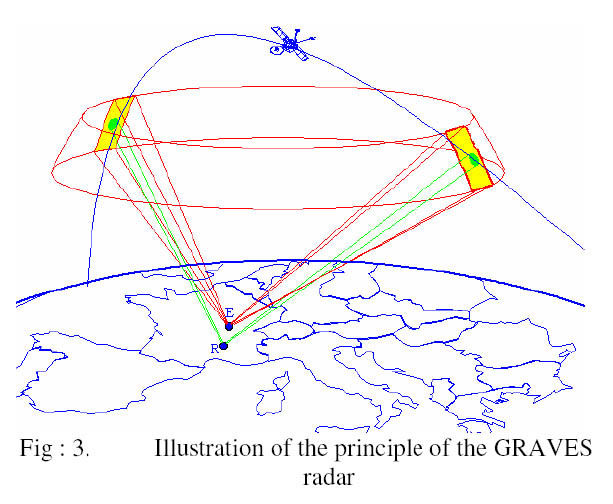 Here is a document with more details about the radar algorithm. This document is also featured in DUBUS Magazine 4/2007. Note: The radar pattern is recently (july 2012) changed. There seems to be a 1.6 second tx sequence. sometimes it looks like 0.8 seconds. So the animation is not correct at this moment! I will correct this when possible. When listing to the radar different reflection types can be heard. The pictures above shows typical airplane reflections. The most reflections are +/- 20Hz from the main radar signal but up to 200Hz is possible. Click on picture to see a higher resolution. I doing some more research on airplane reflections. The picture abve shows a moon reflection at 143,0503Mhz. (Pictures shows 27.0527MHz because of converter offset). Also the airplane reflections can been seen around 143.050MHz (27.0524MHz). The moonreflections are audioable when setting the receiver to ssb mode. This is a recording: graves_moonreflections (WAV). (Have to change the recording to a better one). 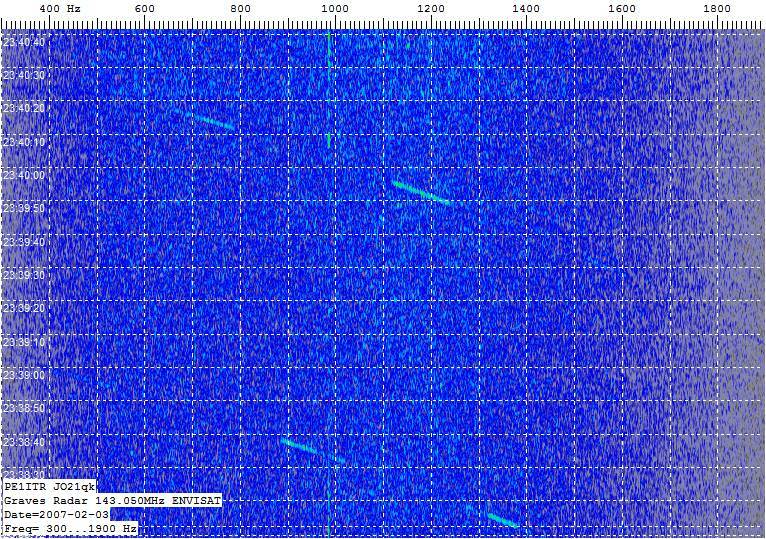 Graves tropo signal on 143.050MHz (27.0524) and the ISS on the right on a south-west to north-east pass around 30 degrees elevation. The signal spans 10Khz from AOS to LOS. 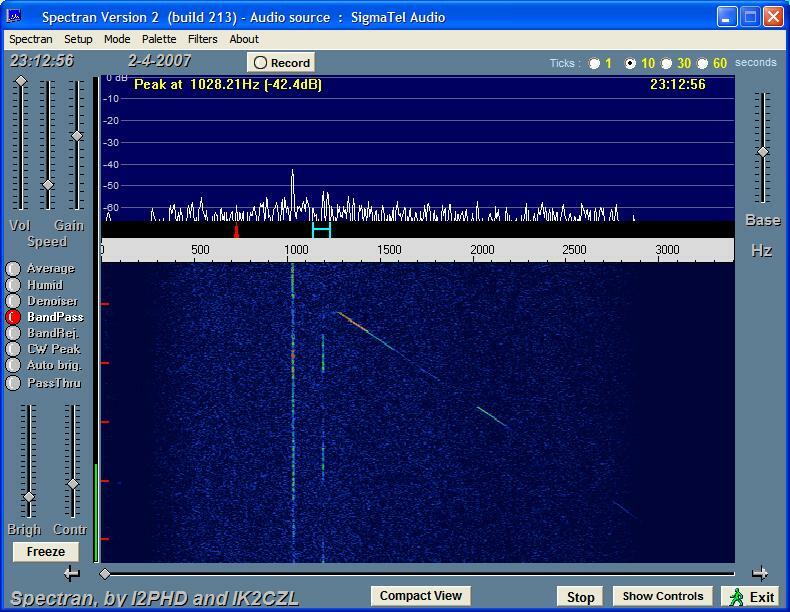 Just above the ISS signal is a weaker signal probably from the Progress satellite. 200Hz on the left from the Graves Tropo signal is the moonreflection while my antenna was tracking the ISS and pointing to the moon at some point. This is a sound recording of reflections on the International Space Station. I used automatic doppler correction while recording. (2008-4-17). Recently I built an interferometer for various types of reflections received. The interferometer consists of a coherent 2-channel receiver connected to an antenna for each channel. Here is a link to the interferometer with waterfall pictures of different reflections of graves. Notice the relative high count on the section 0 beam direction. It looks like that one of the beams of section 0 of one of the sectors (A or B?) is in line with an airplane traffic route.